Plug & Play technology solution empowering your customers to Quote, Compare & Buy. Offer instant quotes to clients, helping them find the best policy for the best price, all in one place. Position your brand as a technology powerhouse by offering customers an easy-to-use Quotes, Compare & Buy tool. 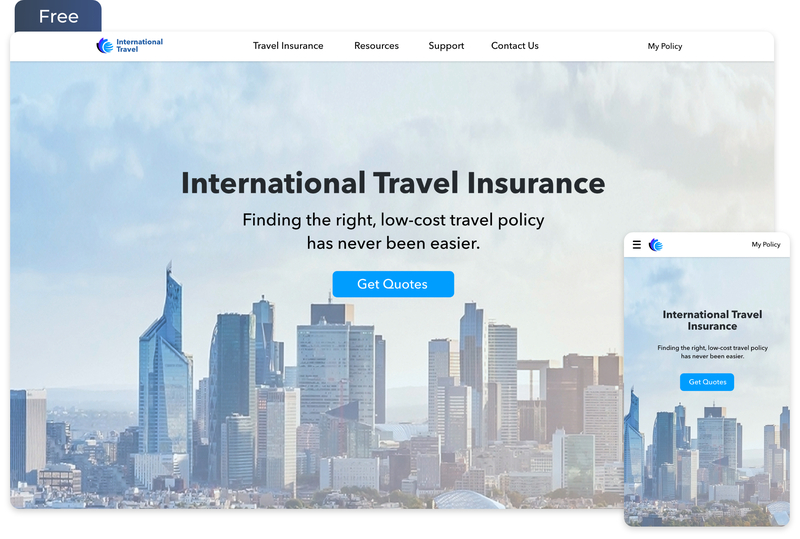 Leverage existing customers to create your own travel insurance marketplace, putting yourself in a perfect position to cross-sell travel insurance. With over a decade of experience in the travel insurance industry, we are able to provide our partners the best commission rates in the industry. Offer your customers all kinds of travel insurance plans form reputed insurance providers. Stay up to date on your sales and earnings with our real-time dashboard. Get valuable insights on what types of policies your customers are buying. Our team is dedicated to making the process as easy as possible. We will guide you every step of the way to ensure that your set up is perfectly executed. Once the integration is complete, you'll have a dedicated account manager to answer any questions. They will be continuously looking to optimize your webpage and go the extra mile to ensure that you are successful. We understand that your time is valuable and creating relevant content takes time. As a TMQuotes partner, you will receive travel-related articles you can send to customers, educating them about the importance of travel insurance. TMQuotes makes selling Travel Insurance a breeze. Start selling Travel Medical Insurance in just a few steps. We make sure the integration process is simple for our partners. Just add a line of code on your current website and start selling Travel Medical Insurance instantly. It is free and easy to get started. Once you have signed up for TMQuotes, you'll have access to our state-of-the-art platform to create a custom web page. Our team of experts will guide you through the process, ensuring that you get set up in no time. TMQuotes is a technological platform for licensed insurance agents interested in selling international travel medical plans. Easily sign up top Travel Insurance companies, instead of going through them individually. Integrate a robust quoting engine either as an Iframe in their existing website, or a hosted site, if they do not have an already existing website. Maintain the changes that the insurance plans go through from time to time. Get ongoing training about insurance plans for the agents. The sign-up process is easy. You can sign up online and then verify your e-mail. You would receive the partnership contracts from the insurance companies. Once you sign the contracts, the insurance companies also sign the contracts. At this point, you can customize your site, and start selling Travel Medical policies. Any Health Insurance license holder in any US state can sell the policies online to anyone in the world. However, the Florida Department of Insurance does require these agents also to hold a non-resident license to solicit business to Florida residents. Do I have to pay anything to use this Platform? No, you do not have to pay anything to become a partner with TMQuotes. We offer an above industry standard commission. The commission amount varies from product to product. Once you've signed up and become active, you would have access to a sales dashboard that provides real-time data on policies sold daily. It also allows you to view sold policies on a weekly or monthly basis. How and when do I get compensated? You will get compensated directly by the individual insurance companies on a monthly basis. Currently TMQuotes works with four top companies offering travel medical plans-	International Medical Group, Seven Corners, Tokyo Marine HCC Medical Insurance Services and Trawick International, and we are constantly working to add others in the list. If you sign up on TMQuotes, we would work on contracting you with these top companies. Do I have to maintain the webpage? You do not have to do anything to maintain your webpage. TMQuotes will maintain the webpage for you. Can I use TMQuotes if my business is registered outside the US? Currently, TMQuotes only caters to Licensed Health Insurance agents, based out of the US. Do I have to provide customer support to my customers, after they purchase a policy from my site? Yes, you would need to provide support directly to your customers. However, if you need any assistance with customer's questions, you can always reach out to us. I am signed up directly with one insurance company. Can I still move to TMQuotes? If you are already signed up with one or more of the insurance companies and want to move to TMQuotes, you would need to get approval from the insurance company to transfer as our sub-agent. Once you receive the approval, the insurance company will assign you as our sub-producer. I am signed up with another General Managing Agent like TMQuotes, can I move to TMQuotes? If you are already signed up with another General Managing Agent like TMQuotes and want to move to TMQuotes, you would need to get a written release letter from the existing General Managing Agent. Please send the release letter to us, and we will have the insurance company reassign you as our sub-producer. Who can purchase the plans that our website can offer through TMQuotes? The Plans on TMQuotes are available for any international travelers outside their home countries. These include International tourist, international students, Exchange Visitors on J visa, and US Green Card holders coming to USA for short trips. We redefine International Travel Insurance Business. We disrupted the global travel insurance industry by leveraging technology to redefine the way international travelers purchase and manage travel insurance. Through this technology, licensed agents like you can build your own online International Travel Insurance business and improve the online sales process. With over a decade of experience, we work with the best global travel insurance companies in the United States. We'd love to help you scale up your business. Thank you for showing interest in TMQuotes. © 2019 TMQuotes. All Rights Reserved. Powered By VisitorsCoverage.